Domestic content hosting apps like JioTV and SonyLIV have joined the bandwagon with Google, Twitter and Apple to provide live and exclusive coverage of the 2018 FIFA World Cup. The tournament also debuts the VAR technology. As the 2018 FIFA World Cup fever grips the nation, several Silicon Valley-based giants as well as homegrown broadcast players have offered their services to Indian viewers so that they don’t miss the action and follow the real-time updates on-the-go. Here are some ways by which you can follow the game, half-time discussions and post-match analysis even if you are not at your home or in front of a TV. FIFA has updated the official app for the 2018 FIFA World Cup Russia so that users can receive real-time notifications. You can re-live key moments in World Cup history with our exclusive videos and photos. This is on top of the usual breaking news and exclusive interviews from FIFA.com, plus live scores from 197 world leagues and international competitions across the globe. Fans can also discover the players and coaches from all 32 competing teams and get access to their profiles and live stats throughout the tournament. You can also vote for the Man of the Match. 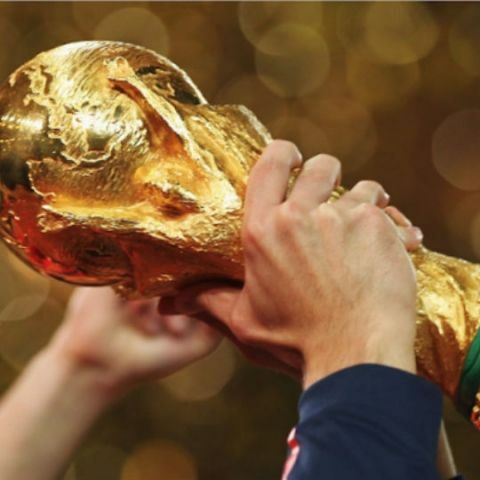 Starting June 14, JioTV app will host the live broadcast of FIFA World Cup. The premium content will be available to all Jio users absolutely free. As per company sources, Jio is strengthening the content portfolio with exclusive deals with leading content giants and broadcasters. Recently, Jio launched Jio Double Dhamaka pack where users will get high-speed data for as low as Rs 1.5 per GB along with free voice, SMS and Jio Apps. Google Earth's awe-inspiring 3D tour of every World Cup stadium in SA! Sony Pictures Network India (SPN) announced that its digital platform SonyLIV app will livestream the matches during the 32-nation tournament. SonyLIV has launched the #ScreamLoud campaign to connect with the football fans in the country. The company also announced a star-studded panel for Football Extraaa, the pre-, mid- and post-match live studio show that will be telecast in English and Hindi. The LIVE TV and Video streaming app from Airtel will also broadcast live the World Cup matches in various local languages in addition to Hindi and English. Airtel TV users will also have access to match schedules and exclusive behind the scenes match snippets along with match previews/ reviews. To enjoy these updates, Airtel TV users simply have to upgrade to the latest version of the app which is available on both Android and iOS platforms over the coming days. 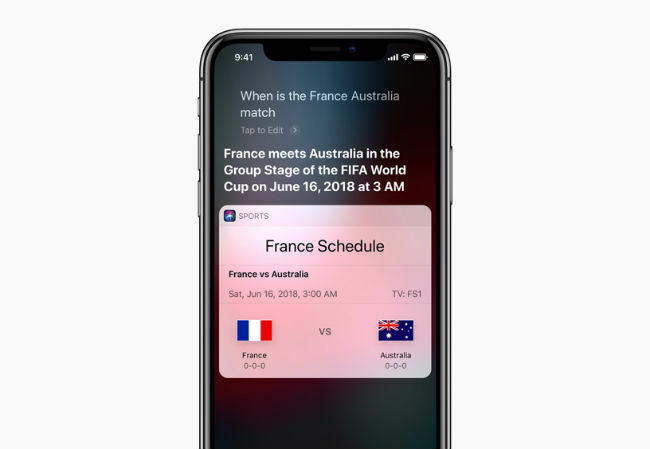 With Siri sports support, users can take Siri’s help to stay up to speed on stats, scores and their favourite teams across all Apple devices. Fans can explore Apple’s curated collection of football apps and games to help make the most of the tournament. Throughout the month, the App Store editors will highlight their favourite apps and games from football stars, offer tips on taking a perfect football photo and how to best get your football fix on social media. The App Store will also feature key football-related apps and games to help fans dive deeper into the experience, with broadcaster apps like FOX NOW or BBC Sport, and games like FIFA Mobile and PES 2018. The News app will also make it easy for users to follow the tournament drama with up-to-date scores and schedules, a knockout bracket and profiles of the event’s key players from Eight by Eight magazine. Twitter has partnered with 24 publishers across 12 countries and regions for delivery of on-field content, studio analysis and behind-the-scenes access. The company has also tied-up with several teams competing in the FIFA World Cup to live-stream tournament-related content on the platform. Within seconds of every goal at this summer's FIFA World Cup, a highlight will be clipped and posted on Twitter. Every night, broadcasters in the US (Fox Sports) and Australia (SBS) will air live analysis shows on the micro-blogging platform. "Looking forward to the updated Search experience for soccer, just in time for the World Cup," Google CEO Sundar Pichai tweeted. Google said Search will show video recaps from select broadcasters featuring goals and highlights of major match moments within 30 minutes of the end of each game. 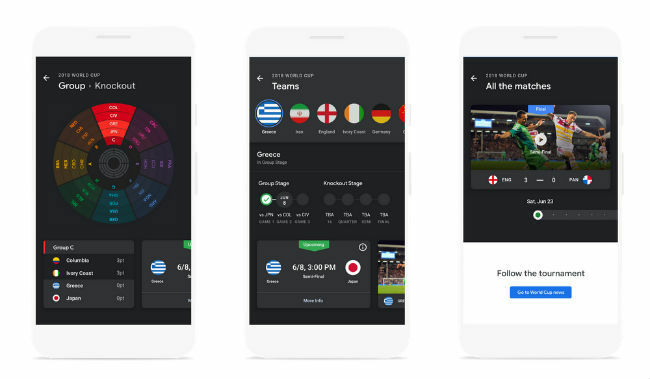 Google has also created a World Cup Tracker on Google News app on Android that will include a special 'spotlight' feature that provides an easy way to visualise live scores, highlights, results, and schedules all in one place. Fans can also subscribe to different channels on YouTube, like FIFATV, to watch live and exclusive World Cup content. The channel also has a set of FIFA Films to tell fans about some of the great stories from the competition's rich history. Several Pages on Facebook will also livestream the games. Users can search for the game in the Search bar and choose any channel to watch the livestream. For example, if you want to watch Portugal vs Spain, you can type “Portugal vs Spain live stream” in the Search bar and then choose a channel to watch the match. As far as technology is concerned, FIFA took the decision to employ Video Assistant Referees (VAR) at the 2018 World Cup. FIFA is to set to implement VAR after testing its use in over 1,000 matches, and says an average of just 55 seconds per game was lost in reviewing replays. The use of VAR will reportedly limit errors in the 2018 World Cup, increasing the success of referees from the current 93 percent to 99 percent. If you failed to participate in the festivities, debate and analysis or simply don’t have time to catch all the games, Amazon Alexa has you covered. Alexa has features and skills to make sure you don’t feel left out of the conversation. Customers can ask Alexa about the tournament. Simply say, “Alexa, tell me about the World Cup” or “Alexa, what’s happening in the World Cup?” to listen to daily match summary and highlights. You can also ask Alexa for football jokes, her favourites and predictions.